While June and July seemed to linger on and on, August flashed by so quickly I barely had time to process everything that happened. I kicked off the start of August by going to a few interviews for fall internships which is always a fascinating experience in and of itself. Lo and behold, I secured an internship which I will begin in a few days. I am extremely excited and can't wait to dive into the whole experience. Also towards the beginning of the month, I headed to the Poconos with my family and spent a few days riding horses, rafting, and relaxing. I didn't snap any pictures throughout the whole trip in an attempt to distance myself from the internet for the few days I had escaped the clutches of everyday life. Those of you who follow me in Twitter might know I got my first sunburn ever and my shoulders are still recovering from the skin damage. 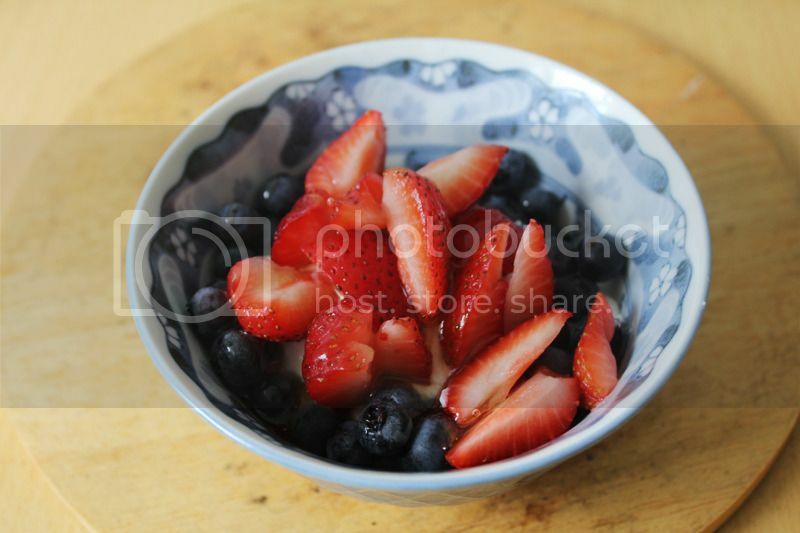 Now why did I start off this monthly wrap up with a photo of fruit in a bowl? Well, I actually spent quite a bit of time at home this month and have decided that I need to adjust my diet to be more wholesome. Also, I was thinking ahead to how I would plan my meals once school started again. I have been loving greek yogurt (yes, there is some yogurt under all that fruit and honey) which has been a breakfast food of choice this past month. A few months ago I tried Chobani for the first time and could not get over the tart taste and thick texture. This time I gave Fage a try and I like mixing in lots of fruits and some honey. I've tried various fruits and my favorite is probably banana with the yogurt. I usually eat a decent amount of vegetables but over the past month I have definitely increased my vegetable intake, while lowering my meat intake. Partially this is due to my Mom having had her gall bladder surgery this month and her trying to eat healthier as well. 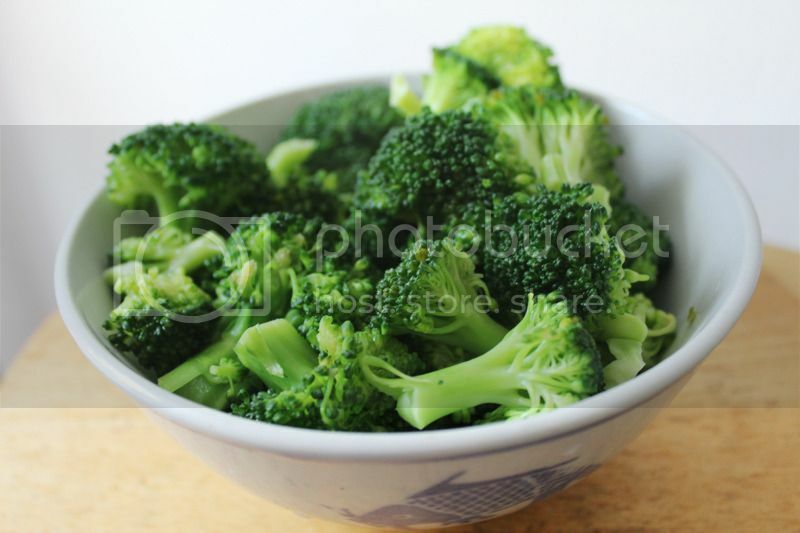 I absolutely love broccoli and can eat it simply boiled. I still don't have a variety of recipes under my belt so I normally cook some type of egg dish for lunch if I'm hungry. One omelette fails to fill me up so I usually prepare a side of sauteed vegetables. Mushrooms are another favorite ingredient that frequents my easy dishes. My boyfriend and I also made mac n' cheese from scratch one day and it turned out fantastic but I didn't take a picture. It's not the healthiest thing in the world but sometimes I have to have my comfort food! My cousins wanted to have dinner at Bare Burger so I went along and tried a combination I had never tasted before: the pesto red pepper burger. I just recently discovered that raw spinach actually tastes pretty darn good and I love how it tastes in salads and with proteins. Delish! Unlike the bareburger supreme and the california veggie burger I had ordered on previous Bareburger outings, the pesto red pepper was the perfect size and I finished it in one sitting. 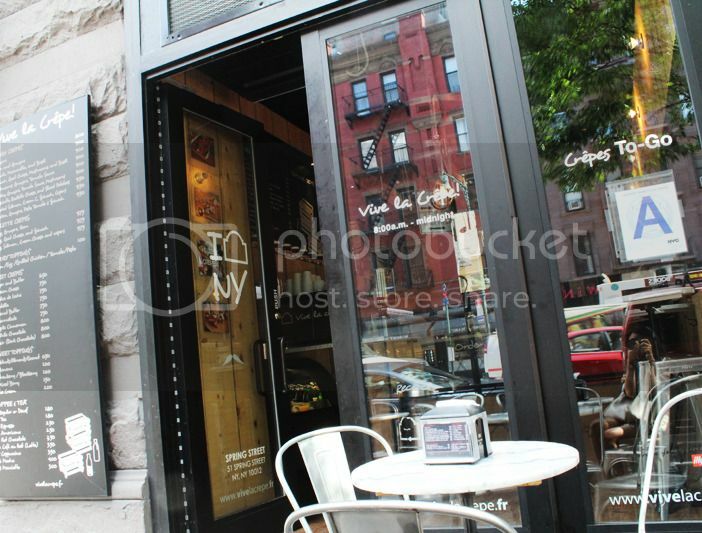 On one of our outings on the Upper West Side, my boyfriend and I had an impromptu snack at a creperie. It was my first time trying a crepe and I was pretty pleased. 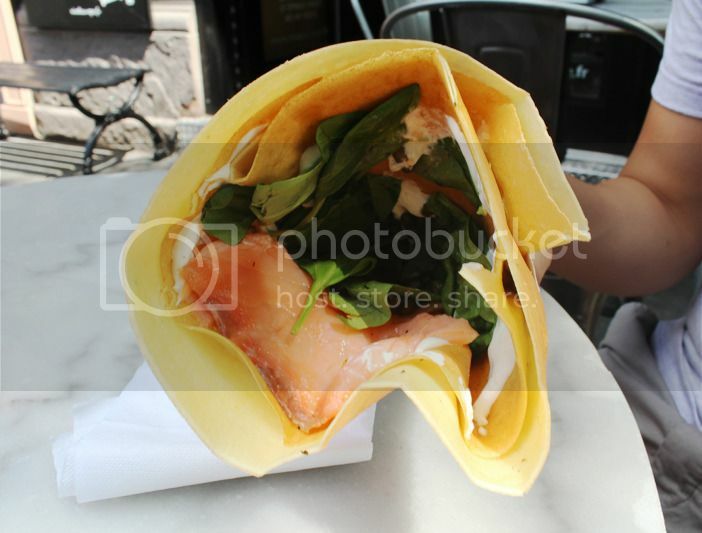 We chose the salmon, spinach, and cream cheese crepe which was pretty delicious. I'm not exactly sure what a crepe is supposed to taste or feel like but this one was decent. I want to try a sweet crepe next! Just to continue on with the food pictures (am I making you hungry yet? ), my absolute favorite type of pizza is white pizza. Once in awhile I will treat myself to a big slice from a local pizzeria while my boyfriend chooses one of the pasta pizzas. I do not want to think about the caloric content or grams of fat that a single slice contains but my stomach is definitely pleased after a white pizza lunch! Onto the non food related events of the month.... I finally visited the World Trade Center memorial for the first time. 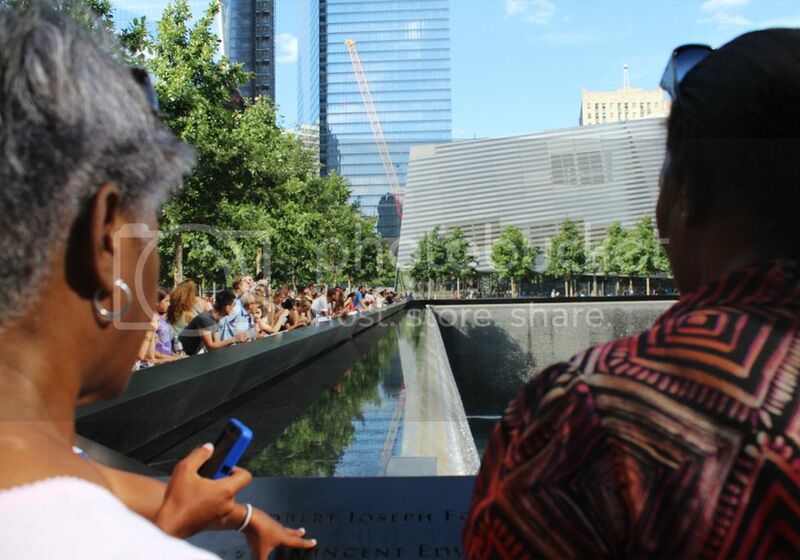 I had never been in the World Trade Center when it still existed and for a few years have wanted to visit the memorial. The process of gaining entrance into the memorial is quite a hassle but it is worth the wait and endless security checks. The waterfalls and whole plaza is beautiful and when the area is finally finished and opened to the public, I think it will be a gorgeous place. After a fruitful summer, I'm not too upset about going back to school. The fall semester started last week and so far I find half my classes intriguing and the other half... not so much. Nonetheless, school is school and it's pretty crazy that I'm a junior already. Time is flying by! What have you been up to this past month? Are you sad to see summer go or are you excited for fall? I know I'm already ready for fall in terms of wardrobe and makeup! Your food pictures are making me hungry and looks very delicious and healthy. This month has gone by so fast that I can't even remember if I did anything worth noting. I hope your foot heels soon enough. I'm still not ready for fall yet but I know it's going to hit us any day now. That's how I always feel when it's 12am and I'm looking through food photos! When you really look back I'm sure there were some highlights :) You're probably just really busy so you can't think of anything in particular. The fall and winter in your part of the country is probably more harsh than it is on the East Coast. I can't wait to wear my boots and jackets again! I still haven't gotten use to the taste of yogurt. I wish I can though because it's such a healthier snack option. 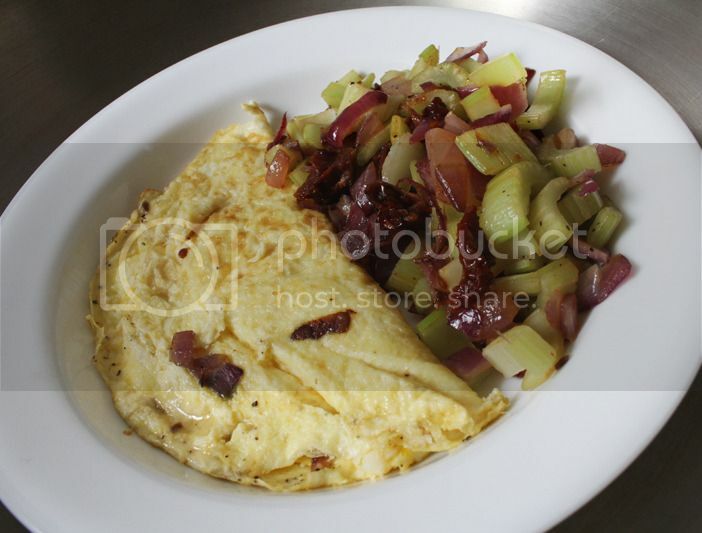 The omelet looks delicious! :D I love how you're changing your diet (gives me motivation!). Could you post more of how that goes? Good luck at your new internship! At first I didn't like the taste of really tart yogurt either but when you mix in a lot of fruit it becomes infinitely tastier! I'm trying to cut back on buying processed foods and eating more fresh produce and raw veggies in salads. I still let myself indulge in some snacks and not-so-healthy food items though. I'll try to take more photos of what I eat although I tend to forget! Goodluck finding an internship for yourself! I hope you land a position at a company you love! I have a love and hate relationship with greek yogurt. At times I forget that I'm not eating creamy yogurt and I just gag from the texture and taste : / But my favorite Chobani flavor is the apple and cinnamon one though, haha. Gosh, I can't get over how crisp and clear your pictures are! I think I've gotten used to the taste and texture of greek yogurt already and prefer it over regular yogurt! I buy the larger containers of plain greek yogurt and mix in my own fresh fruits and toppings because I think it's more cost efficient. I love raw/cooked spinach! If you haven't already tried a spinach salad with poppy seed dressing, I highly recommend you do. I usually add a boiled egg and some grilled chicken to add more flavor. Thanks for the suggestions. I've never heard of poppy seed dressing so I'll have to look for it next time! Haha, I feel like I'm being too dramatic with the cast thing but I'm paranoid of people stepping on me since it's so hectic everyday!